Iowa destroyed Nebraska for a second straight year, and have now won three in a row against the Huskers. The game started off ominously. Parker Hesse’s scoop-and-score was overturned after further review, Colten Rastetter gifted Nebraska seven points when he butterfingered a snap, and Stanley Morgan cashed in with a one-handed touchdown. When Ihmir Smith-Marsette fielded the ensuing kickoff out of bounds at the one yard line, it seemed like it wasn’t Iowa’s day. Iowa showed resilience in grinding out a 15-play, 99-yard drive to even the game. Kirk Ferentz rolled the dice on a fourth-and-inches sneak by Nate Stanley, and the move paid off when Akrum Wadley galloped 20 yards for the score. The drive included a number of screens to Smith-Marsette with Brandon Smith out in front blocking. Smith is a big, physical wide receiver and did well to give the speedy Smith-Marsette time to get to the corner. Nebraska shot itself in the foot on at least two occasions. Instead of taking three points, the Huskers got cute with a fake field goal attempt. Nebraska native Nathan Bazata swallowed up the ball carrier and did the signature “Blackshirts” celebration, swinging momentum in Iowa’s favor. After Nebraska took a 14-7 lead, the Huskers again lent Iowa a helping hand. Rastetter was again out to punt and rolled to his left before uncorking a rugby-style kick. Rastetter was roughed on the play, extending Iowa’s drive. The Hawkeyes marched 75 yards on 11 plays, culminating with Omaha native Noah Fant’s first touchdown of the contest. The score knotted the game at 14 and came with just 25 ticks left in the half. Iowa got the ball to begin the second half as well, so the play was a big momentum boost going into the locker room for the Hawkeyes. Ihmir Smith-Marsette kept the pedal to the medal, returning the second half kickoff for a touchdown and atoning for his earlier mishap. Geno Stone was flagged for a block in the back, but Iowa still started at Nebraska’s 22 yard line. Minutes later, Wadley gave Iowa a lead it would never relinquish. Nate Stanley connected with Fant on a 44-yard bomb, and James Butler scored his first touchdown as a Hawkeye one play later. The rout was on. It had to have made Husker fans sick watching Noah Fant dominate. Fant became the first Hawkeye to eclipse 100 yards receiving this year by catching three balls for 116 yards and two touchdowns. Wadley also achieved a feat rarely done. He became only the third opposing player in the last 20 years to rush for at least 150 yards and three touchdowns in Memorial Stadium. In doing so, Wadley also clinched his second consecutive 1,000 yard season, becoming the fourth Hawkeye to accomplish that feat. He wasn’t done, as he also moved into third in Iowa history in touchdowns scored (34). 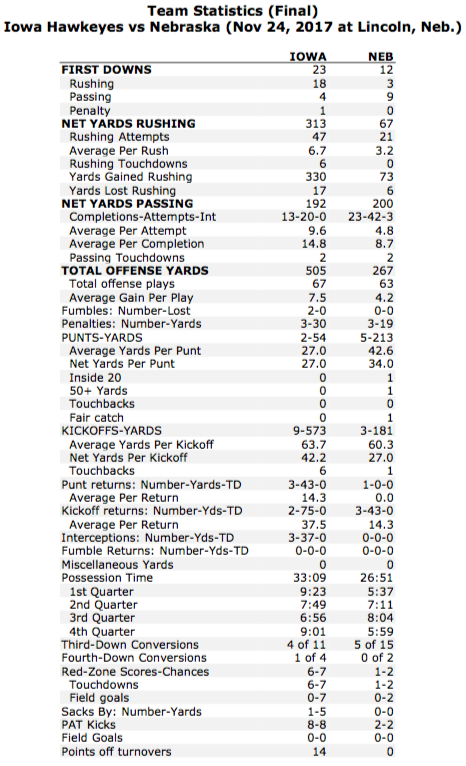 The Iowa offense reached another peak after bottoming out the two weeks following the Ohio State massacre. The Hawkeye offense has scored 50+ points in two Big Ten games and failed to reach the 20-point mark in six others. The last time they did that was 1904. That speaks to the fascinating inconsistency of this offense. It will be interesting to see 1) where Iowa ends up during bowl season, and 2) how the offense performs with a month to prepare.